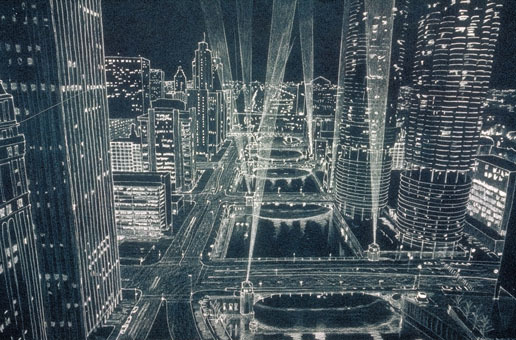 Randal did this white ink and pencil illustration of Chicago bridges at night for a project funded by the Open Lands nature conservancy project. The illustration was used in a report designed to highlight how the Chicago River could be developed and turned into an amenity for Chicago, rather than the eyesore that it was back the 1980’s. Interestingly, The City of Chicago has since implemented many of the recommendations and ideas put forth in the Open Lands report. This illustration is part of a series commissioned by and in collaboration with Jonathan Boyer, a Chicago area architect.